This article is about modern city of Korla, sometimes known as Kroran, in China. For the ancient state also known as Krorän, see Loulan Kingdom. For the organist, see Korla Pandit. Korla (sometimes as Kurla, or Kurle) is the second largest city in Xinjiang, and is, administratively, a county-level city and the seat of the Bayingolin Mongol Autonomous Prefecture, which is larger than Great Britain and is the largest Chinese prefecture. Korla is also known for its "fragrant" pears. Korla is approximately 200 kilometres (120 mi) southwest from Ürümqi, although, due to the intervening Tian Shan, the road distance is considerably greater. The Iron Gate Pass (Tiemen Pass) leading to Karasahr is about 7 kilometres (4.3 mi) north of the city and, as it was easily defended, playing an important part in protecting the ancient Silk Roads from raiding nomads from the north. The Kaidu River, also known as the Konqi River or Kongque River, flows through the center of Korla, a unique feature amongst cities in Xinjiang. 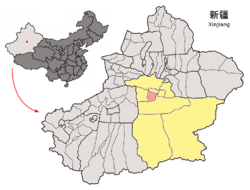 While the literal meaning of the Chinese name "Kongque River" is "Peacock River", the name originates from a semantically distorted transliteration of the Uyghur name "Konqi Darya" which means "Tanner's River". Korla has a cold desert climate (Köppen climate classification BWk) with extreme seasonal variation in temperature. The monthly 24-hour average temperature ranges from −7.0 °C (19.4 °F) in January to 26.4 °C (79.5 °F), and the annual mean is 11.66 °C (53.0 °F), which is still warmer than most locales at the same latitude further east in the country. Precipitation totals only 57 millimetres (2.2 in) annually, and mostly falls in summer, as compared to an annual evaporation rate of about 2,800 mm (110 in); there are about 3,000 hours of bright sunshine annually. The frost-free period averages 210 days. The period between April and October closely resemble subtropical climates, but the continental nature is facilitated by the rapid drop of temperatures going into winter. Korla has long been the biggest centre in the region after Karashahr itself, having abundant water and extensive farmlands, as well as controlling the main routes to the south and west of Karashahr. Due to the discovery of oil in the Taklamakan Desert, Korla is now both more populous and far more developed than Karashar. Korla is home to a huge operational center for PetroChina's exploration in Xinjiang. Korla is known for its production of fragrant pears (库尔勒香梨), which are well known in the region for their sweetness and flavor. Korla is served by the national highways G218, G314, the Southern Xinjiang Railway and the Korla Airport. As of July 7, 2009, there was no internet connections and all international telephone communication was cut within the entire province of Xinjiang, including the city of Korla. On October 1, 2009, a partial relaxing of the internet allowed some Chinese websites to function, but only as "readable" and not "writable". As of February, 2010, the province is still largely cut from global communications, and tourists from outside of the province and from abroad have complained of a lack of ability to keep in touch with family and friends outside the province. In May, 2010, internet access was restored to the province. The city had 430,000 inhabitants in 2007, increasing with 20,000 people every year, majority of whom were Han Chinese, with a large minority of Uyghurs (about 100,000) and smaller numbers of Mongols and Huis. Korla was known as Yuli (尉犁) (reconstructed pronunciation of first character: *i̯wəd) during the Han Dynasty. Yuli is said in the Hanshu or 'History of the Former Han' (covering the period 125 BCE to 23 CE), to have had 1,200 households, 9,600 individuals and 2,000 people able to bear arms. It also mentions that it adjoined Shanshan and Qiemo (Charchan) to the south. In 61 CE, the Xiongnu led some 30,000 troops from 15 kingdoms including Korla, Karashahr, and Kucha in a successful attack on Khotan. In 94 CE, the Chinese general Ban Chao sent soldiers to punish the kingdoms of Yanqi (Karashahr), Weixu (Hoxud), Yuli(Korla), and Shanguo (in the western Kuruk mountains). "He then sent the heads of the two kings of Yanqi (Karashahr) and Yuli (Korla) to the capital where they were hung in front of the residences of the Man and Yi princes in the capital (Luoyang). (Ban) Chao then appointed Yuan Meng, who was the Yanqi (Karashahr) Marquis of the Left, king (of Kashgar). The kings of Yuli (Korla), Weixu (Hoxud), and Shanguo (in the western Kuruk mountains) were all replaced." After the rebellion of the "Western Regions" (106−125 CE), only the kings of Korla and Hoxud refused to submit to the Chinese. Ban Yong, the son of Ban Chao, along with the Governor of Dunhuang, attacked and defeated them. The 3rd century Weilüe records that Korla, Hoxud and Shanwang (Shanguo) were all dependencies of Karashahr. In May, 1877 Yakub Beg, the Muslim ruler of Kashgaria, died here, prompting the reconquest of Kashgaria by the Qing dynasty. The detailed histories listed under Kashgar, Khotan and Yarkand. ^ Hulsewé, A. F. P. and Loewe, M. A. N. 1979. China in Central Asia: The Early Stage 125 BC – AD 23: an annotated translation of chapters 61 and 96 of the History of the Former Han Dynasty, p. 177. E. J. Brill, Leiden. ^ Hill (2009), p. 45. ^ Hill (2009), pp. 45; see also: 412-413. ^ Younghusband, Francis E. (1896). The Heart of a Continent, p. 148. John Murray, London. Facsimile reprint: (2005) Elbiron Classics. ISBN 1-4212-6551-6 (pbk); ISBN 1-4212-6550-8 (hardcover). Wikimedia Commons has media related to Korla.